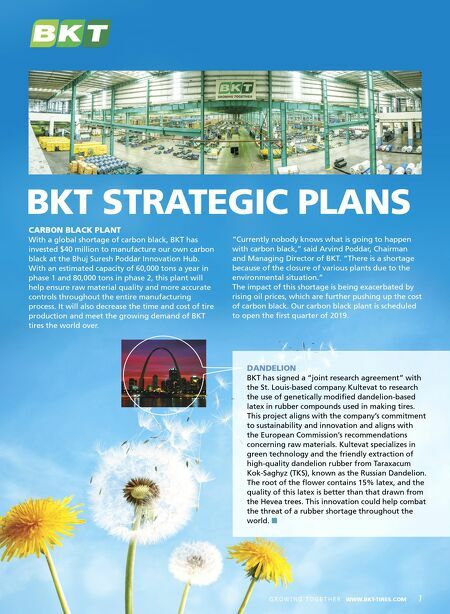 7 G R O W I N G TO G E T H E R WWW.BKT-TIRES.COM BKT STRATEGIC PLANS DANDELION BKT has signed a "joint research agreement" with the St. Louis-based company Kultevat to research the use of genetically modified dandelion-based latex in rubber compounds used in making tires. This project aligns with the company's commitment to sustainability and innovation and aligns with the European Commission's recommendations concerning raw materials. Kultevat specializes in green technology and the friendly extraction of high-quality dandelion rubber from Taraxacum Kok-Saghyz (TKS), known as the Russian Dandelion. The root of the flower contains 15% latex, and the quality of this latex is better than that drawn from the Hevea trees. This innovation could help combat the threat of a rubber shortage throughout the world. n CARBON BLACK PLANT With a global shortage of carbon black, BKT has invested $40 million to manufacture our own carbon black at the Bhuj Suresh Poddar Innovation Hub. With an estimated capacity of 60,000 tons a year in phase 1 and 80,000 tons in phase 2, this plant will help ensure raw material quality and more accurate controls throughout the entire manufacturing process. It will also decrease the time and cost of tire production and meet the growing demand of BKT tires the world over. 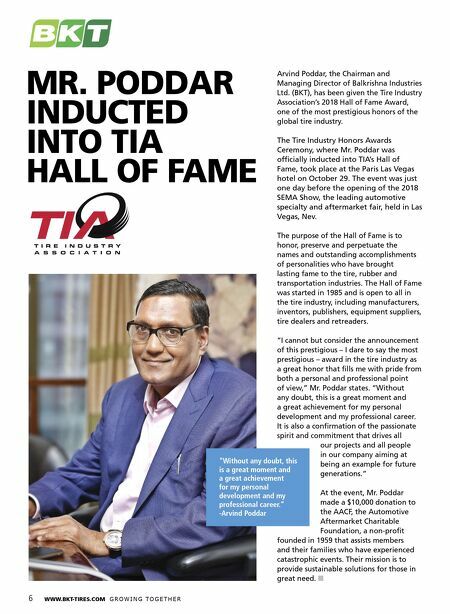 "Currently nobody knows what is going to happen with carbon black," said Arvind Poddar, Chairman and Managing Director of BKT. "There is a shortage because of the closure of various plants due to the environmental situation." The impact of this shortage is being exacerbated by rising oil prices, which are further pushing up the cost of carbon black. Our carbon black plant is scheduled to open the first quarter of 2019.